In August, we shared the first look at a new villain in Star Wars: Episode VII: a cyborg holding the remains of Darth Vader’s charred helmet. 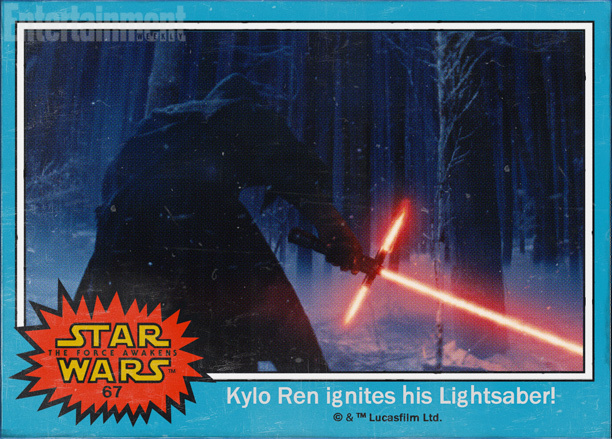 More recently, this character has provided one of the highlights in the official Star Wars: The Force Awakens trailer as he ignites his unique red lightsaber in a cold, dark forest, and Lucasfilm has confirmed through Entertainment Weekly that his name is Kylo Ren. The flared dome is reminiscent of Vader’s, of course, and he wears it beneath a hood, not unlike the Emperor’s. The hood and cloak are ragged and tattered in many shots, but we have no way of knowing if that’s his style or if the events of the film leave him in rough shape. 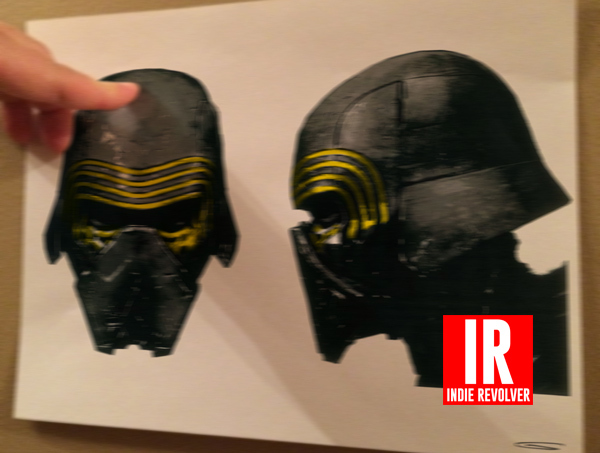 We’ve been told that the final helmet includes the scribed lines around his brow, but no longer colored in yellow. 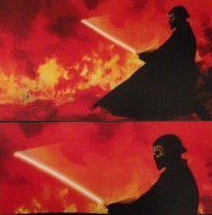 The facemask is removable – a trait which appears to be shared by some of the Episode VII troopers – which leaves Kylo more similar in appearance to his scenes with Vader’s helmet. Making Star Wars discussed this helmet previously in one of their many concept art write-ups. We’re trying to confirm many other aspects of the character with different sources, including that he begins the film with the leaked “Wampa Saber” as his own weapon. That could indicate that his broadsword is one of the “Sith relics” we’ve heard so much about regarding the story of Episode VII. It certainly looks different from the traditional saber blade – it appears to be made not just of light, but electricity and flame. Will Kylo Ren be as iconic a screen villain as his Sith predecessors? Vader and the Emperor are classics. Even Darth Maul seems to have survived with a stronger reputation than his prequel trilogy. We’re looking forward to seeing what the future holds for Kylo Ren, and hoping his character makes it past the first film! UPDATE: A wise Jedi friend from the best Star Wars Fansite just hooked us up with a new image of Kylo Ren! This entry was posted in Breaking News, Film, Star Wars and tagged JJ Abrams, Kylo Ren, Star wars, Star Wars: Episode VII, Star Wars: The Force Awakens, The Force Awakens. Bookmark the permalink.